Don’t let the price fool you though- Spike is packed full of features that you won’t see in other brands at twice the price. Our customers spoke and we listened. 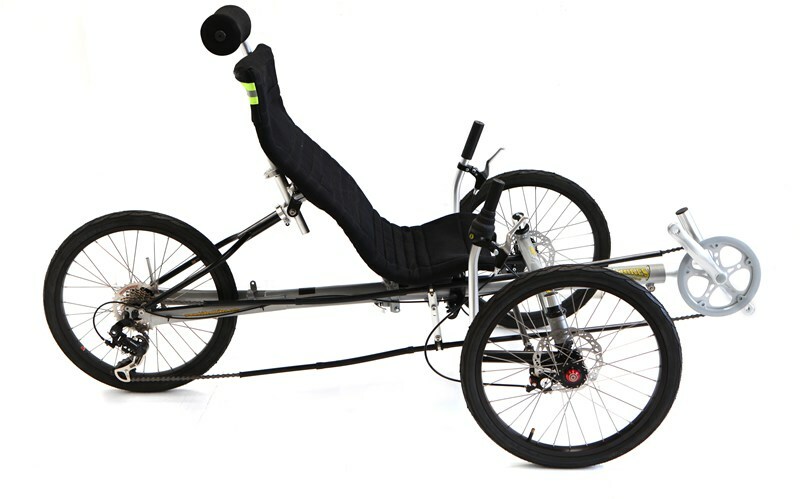 Not everyone is ready to commit $3,000 to their first Trike, but everyone wants something nice and easily upgradeable. Some notable features of Spike include Trident’s exclusive Aluminum Seat that adjusts for both height– 14 5/8 Inches (370mm) to 16 1/2 ” (420 mm) and angle (42-52 degrees), a Folding Chro- Moly Powder Coated Frame, an Anodized Aluminum Boom, Aluminum Seat Frame with Water Bottle Cage attachment bracket, Shimano 7 Speed Deraileur/Shifter, Mechanical Disc Brakes, a Safety Flag and Alloy pedals- all STANDARD. Spike 380 is our newest Spike model for those who would rather not have a derailleur system. It features the Nuvinci N380 system as well as Schwalbe Big Apple Tires and Avid BB5 Brakes .